Now wending our way from sunny Normandy back to the reliable saturation of the west coast of Scotland. Among our prized collection of French foodie goodies is a tin of escargot. I'm looking forward to trying these and comparing to the bulots I had shortly before we left France. Bulots aren't really Dog Whelks (muricidae) as I had previously thought but are actually buccinidae, specifically buccinum undatum, which are really just Common Whelks. I have eaten bulots before, last time we were in France, but I was somehow more aware this time of the strangeness of the experience. Bulots do have a lovely sweet seafoody flavour but the texture takes a bit of getting used to and, because they are quite large, there is a lot of texture to get your gob around. The can also be tricky to get out of the shell whole - this didn't bother my brother-in-law, as he doesn't much like the darker-coloured "skooshy" bit at the end - but I'm quite partial to it. All my own attempts to retrieve a whole one failed, despite the useful tool provided to me for the purpose. 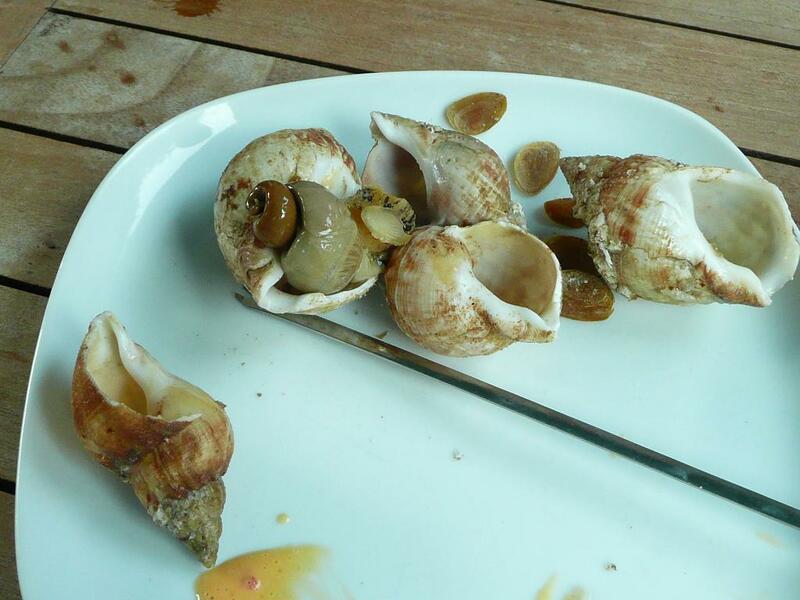 But the lack of total extraction wasn't a detraction from the molluscular experience.